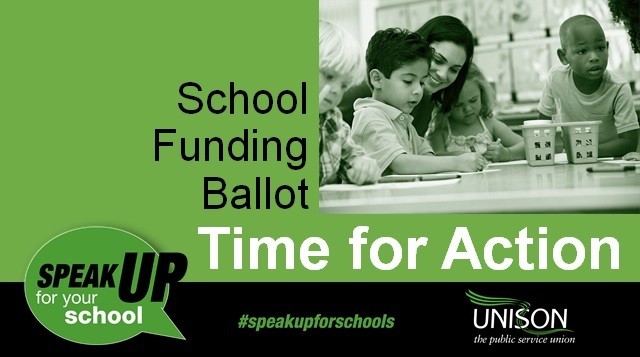 UNISON is conducting an online ballot of UNISON members working on Schools in England. Schools are facing cuts each year that directly impact on our members. The online ballot asks only three questions. 1. Do you believe the government funding cuts are having a negative effect on jobs, workloads, stress, etc. 2. Do you believe Unison should continue to campaign on school funding for jobs pay and terms and conditions. 3. Would you be prepared to take industrial action to secure more money for jobs, pay, and terms and conditions in schools. It’s that simple. UNISON needs to hear from every single member working in a school. We will send you an email when the ballot opens explaining how you can vote. To vote you will need your date of birth and your National Insurance number or UNISON membership number. Please have your say – we need to know what you think.